In the last 10 years in my work as a therapist I’ve heard couples argue about some of the most serious issues. I’ve also heard an equal amount of arguments over the most ridiculous things. The most common, yet benign argument, is over housework. John Gottman says that 69% of marital problems are perpetual issues that will never be solved. This means that you really need to figure out a way to keep the peace and ride the waves of the perpetual problems. When couples come to my office and I bare witness to their arguments over minute things like housework it can be incredibly telling about the state of their relationship. It’s rarely about the dishes, the dirty clothes, or your partner’s decision to move the furniture around without consulting you first. When people dig their heels in and fight tooth and nail over who doesn’t clean up after themselves I think to myself, 1) who cares about the dishes?? and 2) what’s this really about? And those are things that I will quickly verbalize. 99.9% of the time when I call couples out on what they’re arguing about they will admit to me that it’s really not about the dishes. In order to get there I ask questions like, what’s really under your ager over the dishes, why is this so important to you, and what feeling or thought comes up for you when you see your partner’s dirty dish in the sink? I’ll be honest with you – for the last 8 years of my marriage one of our perpetual problems has also been housework (which is why I finally hired a housekeeper). I call this the dirty sock test (because that’s our issue): On any given day as I am picking up around the house I can find my husband’s dirty black socks strewn around like I’m on an Easter egg hunt. I know this about him – he sits down, removes his socks, and kicks them to the side, and there they stay until he or I come around and clean up. I’ve spent 9 years living with this man, I know that’s his habit, we all have them and I know I’m far from perfect – we said for better or worse, right? But if I happen to be picking up the house and I bend down to pick up a few dirty socks and also happen to find myself whispering expletives under my breath, I know that my love tank is empty and he hasn’t been speaking to me in my love language, and I it’s time to ask for what I need. What I might think I need is for him to pick up his damn socks, but what I truly need is much more than that (it's usually quality time). Nobody gets that angry over a pair of dirty socks (or dishes, or furniture, or tardiness) unless there’s something under that anger - the socks just happen to be the blister on the surface. So when you’re ready to snarl, retreat to your corner, send a snarky text or give an obvious eye roll, it’s time to check yourself and ask, what’s this really about? Another way to think about this is to ask yourself, “if my best friend left their socks behind, (left a dish in the sink, or was late for plans) would I blow up?” More than likely it would just roll off your back and you wouldn’t think twice about it. We give our friends a great deal of grace. But when you aren’t nurturing your friendship with your partner its easy to fight about the little things. So what’s it really about? Are you resentful over something that’s missing in your relationship? Those conversations might be more difficult to have, but I’m happy to help. You might not get over those perpetual problems in marriage, but when you’re free from resentment it makes it so much easier to be friends - even if they don’t get around to washing their dishes a couple times a week. You can click here to book a consultation with me and we can talk about how couples therapy might help. These are some of the things I hear in sessions with couples who are trying to rebuild trust in their relationships. They come to me after they’ve discovered their partner has been unfaithful, and they are devastated and wanted to know what the next steps are. After I help them through their initial crisis phase, we talk about rebuilding trust, and what that’s going to look like going forward. I’ve heard many creative solutions to this from wary spouses who have been cheated on, and sometimes they are exhausted with the constant checking they are doing. Checking the emails, checking the texts, checking the location of their phone and making sure it matches up to their story. How long should it take to get home from the grocery store? Is that story about having to stay later at work even true? This can become the reality in the aftermath of an affair, and quite frankly I too become exhausted just listening to all the extra lengths people go to in order make sure their spouses are being truthful. But the honest truth is, if your partner wants to cheat, they will cheat. You can’t affair-proof your relationship. I know that can be incredibly difficult to hear for some. But it can also be relieving when you really break it down. The truth is, no amount of checking is going to keep them faithful, so you can stop driving yourself crazy doing so. In the initial stages after an affair has occurred it is important to negotiate boundaries. No contact with the affair partner, checking in frequently, and giving up passwords for devices if that’s what makes you feel better at the time. However, trust is truly built on the interactions you have with one another after you decide to stay together. Trust is built on faith, and faith must sometimes be blind. I often tell partners who have strayed, if you place even a tenth of the energy you put into your affair into your marriage, imagine the happiness you can have in this relationship. There’s a good amount of reconfiguring, time stolen, and effort put into meeting an affair partner. Imagine if you did that with your partner? It’s easy to get defensive as the questions are asked over and over, but if you’ve strayed then you need to understand it’s not necessarily about your partner wanting to get a different answer from you. It’s really about them having gone through trauma and wanting to regain some sense of normalcy. The person they trusted most and likely didn’t think was capable of cheating broke their trust, and so they are trying to regain their bearings and in some ways, their sense of control. If you are the partner asking the questions, I suggest you ask yourself this: Do you want to know the answer to that question, or do you want your partner to know that you have this question? Those two things are very different. It may seem like you want the answers to all your questions, but if you take a step back and really think about it, are the answers really helpful to you? Once you receive the information you can’t go back, and you can’t “un-see” the images that will float through your mind. I’ll ask you again – do you want to know the answer to your question? Or do you just want your partner to know that you have this question? Similarly you may want to have access – phone, computer, and email passwords. Having access doesn’t necessarily mean that you will be checking daily. It’s really about your partner’s willingness to give you the passwords and access that means all the difference. If you’re having difficulty navigating your way through reestablishing trust with your partner in the aftermath of an affair, I’d love to help. You can click here and schedule a phone consultation that’s totally free and we can talk about how therapy might help one or both of you through the recovery process. Happy New Year! We’ve all heard, “New Year, new me,” right? Well what if 2018 marked the start of a new relationship for you and your partner? 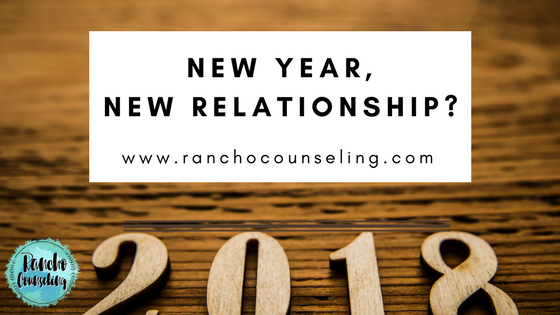 Whether you want to put 2017 behind you because you’re working to rebuild trust or because you just know that you need to put more effort into your relationship, I want to invite you to let this mark the start of a new relationship. In our culture adults often have more than one significant relationship in their lifetimes. People divorce and remarry, end long term relationships, and start over again. But what if you decided that you’d have a new relationship with the same partner? What do you think that would look like? Would you have more connection? Less arguments? Improved communication? Hitting the reset button is totally possible. It’s something I highly recommend not just for the New Year, but anytime you feel stuck in old ways of interacting that you know aren’t working. That’s the beautiful thing about being human. We will inevitably make mistakes, but there’s nothing that says we have to stay stuck in those mistakes. There are a few ways to hit the reset button that I’d like to share with you, and most of them have to do with mindset. 1. First thing’s first - you have to make the decision to be gentle on yourself. How long have you been in your relationship? How long have you been operating and relating in the same patterns? The answers will vary for everyone, but it’s likely been a while. We get stuck in ruts, and it’s easy to go on autopilot, and slip back into old patterns, but the key is not staying there. Once you decide you are going to make a change, be mindful of it, but don’t attach any judgment about it when you fall back into your old pattern. For example, if you decide that you’re going to ask for a time-out when you feel yourself getting overly emotional from now on, but on your first attempt you let your anger get the best of you and ask for that time-out much later than you would have liked, it really does no good to then berate yourself for not sticking to your plan. Instead, acknowledge that it happened, take a couple deep breaths and look forward. Dwelling on what you did wrong will only keep you stuck. 2. My second tip is don’t try to change too much all at once. If you envision your relationship looking completely different, and vow to change 10 things in the next week, you’ll likely fail. It’s best to pick one or two things that will have the biggest impact and nail those things for a period of time before you move on to the next. One of my colleagues is a personal trainer, and she once told me to make a fitness goal that’s almost too easy not to complete. Getting back to an exercise routine after having a baby is daunting, and so I took her advice and decided I’d do 10 minutes of exercise three times a week. I mean, who doesn’t have 10 minutes to take a walk, do some crunches, or lunges? Once I started hitting my goal it made me want to do more, and I got all the positive vibes from accomplishing my goals, even if they were small. The point is that this approach helps to build momentum. What is something small that’s almost too easy to complete when it comes to your relationship? Is it a text a day, a check in every night, an extra hug, or compliment? Start with something small and meaningful and move forward from there. 3. My final tip is to choose something that will have the greatest impact. This can seem daunting, but you might not be breaking it down enough. If you want to have fewer arguments in your relationship, not bringing things up that bother you isn’t going to do you or your partner any good. But can you think of something that kills a few birds with just one single stone? If you want less conflict you’re likely also craving more connection. So can you schedule a date or block out some time to connect on a regular basis? It may not necessarily be about doing less of something, but rather, adding something to your relationship that will have a big impact. When you have more connection and build your friendship, conflict has a way of decreasing. Of course this is just one example, but no matter what your relationship goals are, I have just the ticket for you! Beginning February 1, I’m going to be doing a Relationship Refresh and in the two weeks leading up to Valentine’s Day I’ll send you a tip each day that will help you move your relationship in the right direction. This is something you won’t want to miss, so sign up here. For this Relationship Refresh I’ll be taking my own advice and sharing small things that I’ve found to have the biggest impact, so don’t worry about getting so much info that you won’t be able to complete it all. I hope you’ll join me! Cheers to a new year and a new relationship!